So you’re running social campaigns; posting content, improving your business online presence and connecting with users. All seems to be going well; until someone asks you to prove the value of your social media efforts. Now it can be said that some of the value in Social media management activities can be hard to quantify. Things like brand awareness connecting with customers and creating the right impression with your target audience can be somewhat difficult to express in fact and figures. However it does not need to be that way for all the positive traits of social media campaigns. It is possible to determine ROI from social media campaigns as discussed in my earlier post here. 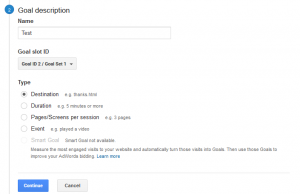 It depends what your goals are from your campaigns; a good way it to use Google Analytics to demonstrate social media ROI. Now select new goal There are few different types of goals. The easiest to set up is a destination goal. You are simply measuring the traffic that arrives on your website (any page you choose) from social media. To set up a destination goal select a template to start with a pre-filled configuration and click continue. 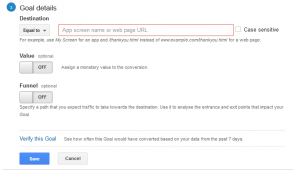 Fill in the goal details:Here you can add the URL of the page you want to monitor you can also assign each conversion (or visit) a monetary value. That’s quite useful when you are trying to show the actual ROI on social campaigns. 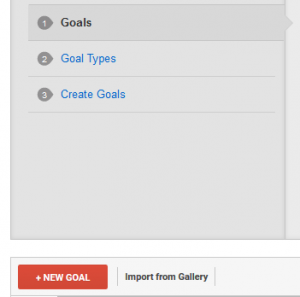 Now you have a goal set up you can easily track the visits to that page coming from social. 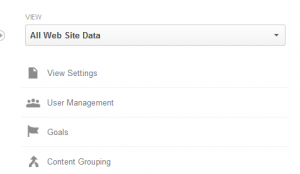 You can now use the conversions report within analytics to track the number of conversions you receive. ← How to measure successful social media campaigns? How to measure successful social media campaigns? 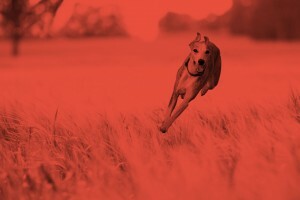 How to use Google analytics to to measure ROI on social media campaigns – Whippet Social Media on How to measure successful social media campaigns?